My journey with Art Journaling started with Anne Penniston Gray. We would gather at her office, she would serve tea and we would create the morning away. When I left those sessions I felt uplifted and whole again. Like most things in life I had great intentions of keeping up with my art journal. I had dreams of finding prompts on Pinterest and I would continue with it... I never did. Then I became a mother & business owner, then LIFE really got in the WAY. Between feedings, sleeplessness and general life upkeep... When was I to find the time? I lost myself for a time - and creativity found me again, and I found myself. This past April I went to Calgary for a whole week. ALL BY MYSELF (yes CAPS are required for that... let me say it again... ALL MY MYSELF). I attended Level One Expressive Art Training with Prairie Institute for Expressive Art Therapy. Our instructor Carmen was reciting a poem one morning and this phrase just stuck with me "...show up with love". Over the next few days, I was reflecting on how I show up with love... for my family... for my business... for myself. I wasn't entirely convinced I was intentionally showing up, in any capacity. This phrase, this week and this clarity prompted me to start doing things for myself again. I felt inspired, in ways I haven't been for years. And now, I need it. I need it like I need to eat, breathe and hydrate! I dream about collaging and my Pinterest is overloaded with new techniques I want to try. I look forward to that 45 min window in the evenings when I can take over my entire kitchen and create. I encourage you to ask yourself, how am I showing up with love? Take three deep breaths. Close your eyes. Imagine a color (any color at all). Does the color have a shape? Take three more deep breaths. Open your eyes. Start by using the color that presented itself while your eyes were closed. Start by putting some paint on your page, with total randomness. Keep painting/stencilling until you feel like the page is covered in a few layers of paint. When you make a “mistake,” just cover with more paint. Place your embellishments/paper/stickers/magazine cutouts onto the page with white glue. Blend with more layering of paint. You can drip paint by mixing with a little water. Or smear paint with a spatula. Ask yourself, does the page feel finished? If yes, then let dry. If no, keep going till it feels finished. Keep making art - it’s good for you I promise. NOTE: This is a rough guideline. Art Journalling is about process not product. It is an open ended, process driven experience, though to start you might find it easier to use a guide for the journal page, you can find all sorts of journal prompts on Pinterest. 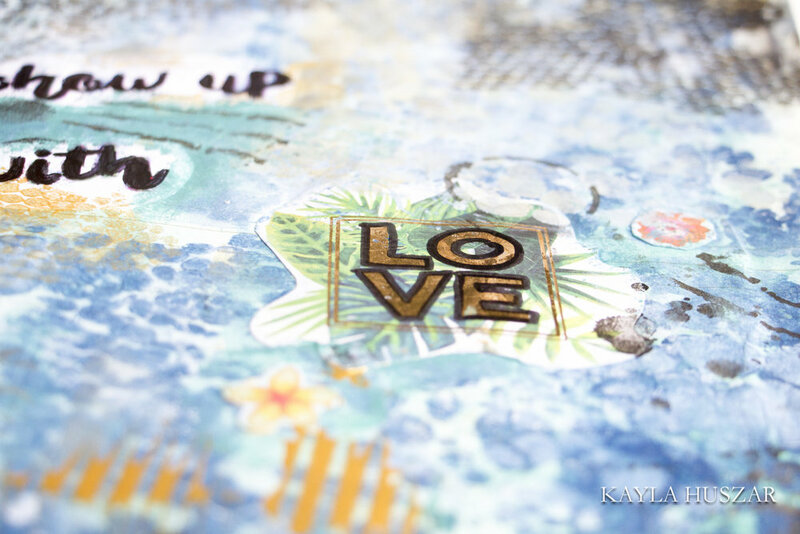 Want to see more of Kayla’s heARTwork? Click here. Have questions about creativity and how it can help you manage your stress, anxiety and/or depression? Connect with me. In my private practice in Regina, SK, I am passionate about helping women find their creative life joy. I offer a free 30 minute in-person consultation to find out if I'm the right support person for you.